LVOV REGION (RUS), ZHITOMIR REGION (RUS), UKRAINE REGION (UKR), UKRAINA REGION (RUS): these bizarre geographic names were used last week on the official website of the London 2012 Olympics to describe the birthplaces of at least a dozen of Ukraine-born athletes representing the Russian Federation (e.g., volleyball player Taras Khtey, judoist Vera Moskalyuk, rhythmic gymnast Karolina Sevastyanova, canoeist Alexey Korovashkov). The errors most likely got there due to sloppiness of the Russian Olympic Committee officials responsible for filling in the athletes' biographical data forms and passing the information to the event's organizers. Several Russian team members born in the Caucasus and Central Asia had their birthplaces mixed up as well. Many netizens in Ukraine found these misplacements offensive and rather typical, however - a kind of a post-imperial Freudian slip reflecting what's often perceived as Russia's possessive attitude towards its neighbors. On the official site of the 2012 Olympics, Ukraine has become part of Russia [...]. I propose writing angry letters to the Russian Olympic Committee (pr@olympic.ru) and to the organizers of the Olympic Games in London (complaints@enquiries.london2012.com). A sample letter [in English] is below. is situated in Ukraine (and was one of 4 cities of Euro 2012)! Kostyantyn Hryshchenko, Ukraine's Minister of Foreign Affairs, got involved, reporting on the steps taken by his office via Twitter. Below are Hryshchenko's exchanges [uk] with the online newspaper Ukrainska Pravda. 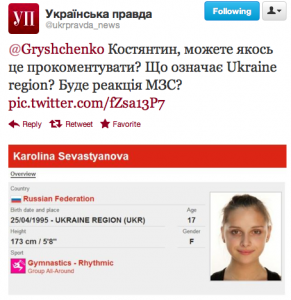 A screenshot of Ukrainska Pravda's tweet addressed to Ukraine's Foreign Minister, featuring a screenshot of the Ukraine-born Russian gymnast's bio page on the London 2012 website. @ukrpravda_news The word "region" definitely shouldn't be there. A silly mistake even from the standpoint of the English grammar. We'll find out whose error it is and get them to correct it. @ukrpravda_news I've just asked our Embassy in Great Britain to get in touch with the organizing committee of the Olympics, so that they corrected this error. A screenshot of Alexey Korovashkov's bio page on the London 2012 website. The gaffe and the subsequent Ukrainian reaction didn't go unnoticed on Twitter. ATT GB Olympic committee: Ukraine - isn't REGION of Russia, it's COUNTRY. Please, ask Sol Campbell. Kipiani's post generated nearly 70 comments; below are a few of them [uk; ru]. The spectre of the Soviet Union has started haunting Europe again! Just an ordinary sports betrayal that everyone is used to already. [...] People have been selling their motherland for gold and food for a few thousand years already. [...] I wouldn't call this betrayal - if a country is offering decent work conditions [...], why would [an athlete] refuse? (and for an athlete this is work). The same way one can consider it a betrayal that thousands of Ukrainians are going abroad to earn money. Most likely, Karolina was born in Ukraine, and is Ukrainian, but lives in and represents Russia. And the organizers must have thought that the region in which Karolina was born (Ukraine) is part of Russia. Is that true? [I guessed it right!] Moreover, Karolina was born in Kiev! Well, well, now there's nothing surprising for me here! Kiev women have always been known for their beauty! Karolina, which passport do you hold? Russian or Ukrainian? I've never lived in Ukraine! I was only born there. After they reported everywhere that I had been born in Kiev, I am getting friend requests exclusively from Ukrainians!